Post offices were among the first institutions in many frontier towns. Now, as Western outposts shrink, losing grocery stores and then gas stations, they're among the last to leave, says Postal Service spokesman David Rupert. 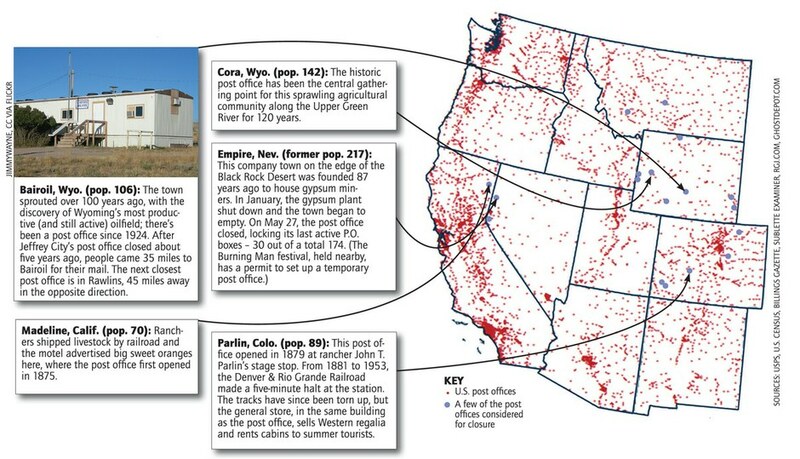 In 1900, there were about 77,000 post offices in the U.S.; today, there are just 27,000. The USPS is funded entirely by revenue from stamps and mailing services, but the amount of mail it handles has dropped 20 percent since 2006, thanks to the recession and the Internet. With this year's predicted $8 billion-plus budget shortfall, the agency plans to close around 2,000 more post offices, including some in tiny towns, such as Shawmut, Mont. (pop. 42). "Who is going to move to a rural town with no post office?" resident Tim Murnion laments.